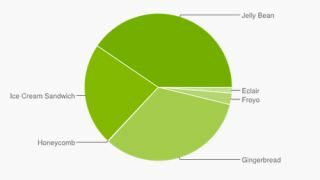 Android Jelly Bean is now running on more than 40% of Google-flavoured devices, but a mere 6.5% were rocking Android 4.2 in July 2013. That leaves 34% of Android devices running the original Jelly Bean (Android 4.1) and fewer than 0.1% on the newest iteration, Android 4.3. In Android 4.3's defence, it has only been out for five minutes (about a week) and is available only to the Google Nexus 7, new Nexus 7, Nexus 4 and Google versions of the HTC One and Samsung Galaxy S4. While no longer top dog, Gingerbread is still the second most used iteration of the OS with 33.1%, while Ice Cream Sandwich is on 22.5%. Pour one out for Donut and Honeycomb, both of which had just 0.1% distribution in July - Google doesn't count anything under 0.1% so we're expecting to see them drop off the chart in the coming months. It's almost boring to talk about Android being fragmented in this day and age. It's 2013. Having lots of versions of Android on lots of devices doesn't exactly seem to be hindering Google. But if buzzwords and controversy get you going, check out the wonderful world of disparate Android devices as shown in colourful charts galore. Adding fuel to the fragmentation fire is the fact that the Google-owned Motorola Moto X will launch with Android 4.2 instead of the newer Android 4.3. What's more concerning for some is that the Google-owned Motorola Moto X won't launch anywhere but the US. Geographical fragmentation: it's a hot new trend.